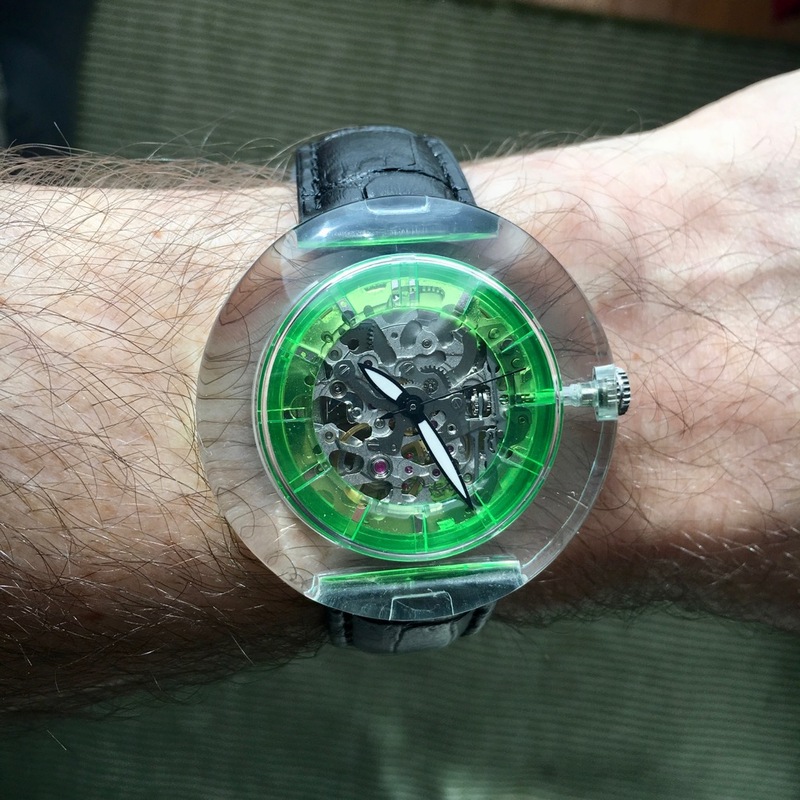 It was just under two years ago that I first ran across the Project O Concept watches, with their unique way of presenting the watch (basically, the crystal subsumed the whole case). After the project closed out, I sort of lost track of them. Then, a little bit ago, I started seeing some news floating around about a new project coming up, one that would bring some additional luminous material to the party. We’ll talk about that at the end, but for now, we’ll focus on the watch as it exists today, in the form of the Project O Concept O1. Now, today, you can certainly find cases that are are mostly (or completely) clear. Those tend to rely on sapphire, though, and are found mostly in the high-end luxury watch models. While I would not call the Project O Concept O1 inexpensive, it’s certainly a good deal more affordable. Of course, that also means that the crystal clear material there is not sapphire. No, here, it’s a polymer of some sort (the brand doesn’t divulge which one, specifically) that is extremely transparent, light-weight, scratch resistant, and UV-resistant as well. The neat thing you have with a case like the one the Project O Concept O1has is that there are no sharp edges or creases (at least until the caseback) with really allows the light to just penetrate in there and show off what is inside. And that’s the other component of the Project O Concept O1, in that the brand really wants you to focus in on the movement doing the work of keeping you on schedule. In this case, the movement is a skeletonized Miyota 8N24 automatic. It looks nice enough, with enough mechanical complexity to keep your eye engaged when you find yourself with a few moments to stare at it. On the other hand, it’s not so busy – or so open-worked – that it makes it difficult to tell the time (which can be a very real problem with some skeleton watches). You might argue that the movement isn’t particularly the star of the inside show for this watch. No, that claim may be laid by, of all things, the movement holder. You see, with the Project O Concept O1 being completely transparent, that allows them to have some fun with the movement holder by introducing color. In our case, we got to see the one in green, but there are also transparent and black options. With the green, it makes it look like it’s glowing in the daylight when sun hits it, which is rather eye-catching. It’s also worth noting that the movement holder, made of the same polymer as the case, also has notches marked out for the hours, again enhancing the ability to actually tell the time. Now, I had mentioned that the green movement holder looked like it was glowing in the light, but that was just that – an illusion. While there is some luminous material on the hands, that’s it. Unless, that is, you check out the just-launched Kickstarter project. In most of the mechanical specs, these watches are identical. The big change is the movement holder, which has been redesigned a bit, and also is made of a luminous polymer (and that looks amazing in the lume shots). Whichever of the models you go for, you’re going to have a very light-weight companion on your wrist. Even with the mechanical movement, the watch head only weighs 22 grams (just goes to show how much weight a metal case brings to the party). Time will tell how robust and long-lived the case itself is, but the brand feels fairly confident in it. One thing to note, here – with the case being a single piece (aside from the case back) plastic shell, you do hear the rotor spinning quite clearly. Not to the point that you think there’s mechanical damage, but it is noticeable (oddly enough, the ticking is fairly subdued). You may also find, as we did, that the strap is a bit squeaky in the lugs of the case, no doubt due to the interaction between the edge finishing and the case material. If I could make one design suggestion, it would be: One wonders if you would tint the polymer of the case a bit. Or, get really crazy, and come up with a bracelet made of the same polymer. What spoke to me the most about this watch: It’s a daring design, and the concept is certainly a unique one.